Laurentide Aviation first got off the ground in 1946, when founder Jack Scholefield completed his military career with the R.C.A.F. His original goal: to provide the best professional flight training in Canada. The company established its excellent reputation early, the first twenty years at Cartierville Airport, and since 1970 at its own private airfield just 15 minutes west of Dorval Airport. We are Canada’s oldest commercial flight training school, helping 150 to 200 pilots earn their license every year. Our strength lies in advanced training: during the last 50 years over 600 of our graduates have moved into careers with Air Canada and other major International Carriers. Our fleet of 7 aircraft includes one Grumman Cougar multi-engine aircraft equipped for advanced instrument training. Basic training and time building are conducted in our two-seat Cessna 152 and four-seat Cessna 172 trainers. Our ATC-810 simulator is also available for Instrument training. We are still a family business, owned and operated by Terry McConnon and proud of our personalized service. Our staff continues to be committed, knowledgeable and provide a first class friendly service, with the guarantee that there will be no waiting for takeoff. 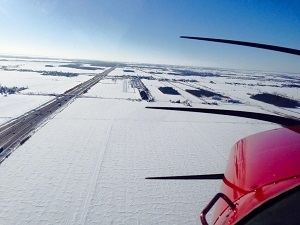 We remain committed to providing the most professional flight training in Canada. The major airlines in the US have hired more than 15,000 drivers in previous years. So, what do you expect to start? A 5% discount on flying time is offered for a deposit of $3000. A 7% discount on flying time is offered for a deposit of $6000. UNCONTROLLED AIRPORT Flying at busy airports means spending more time and money on the ground taxiing and waiting for clearance. Laurentide Aviation is located at a quiet uncontrolled airport allowing students to get in the air and into the practice area quickly. Laurentide Aviation is located close to three major Canadian airports, offering experience in controlled airspace. LOCATION Laurentide Aviation is conveniently located just 30 minutes away from the city, 15-20 minutes away from the West Island, accessible by both highway 20 and 40. With the newly developed highway 30, we are just a short drive from the South Shore. DIVERSE FLEET Our fleet of seven single engine Cessna aircraft offers consistency and dependability to students. We also offer a Grumman Cougar for multi-engine training. MAINTENANCE Our in-house Aircraft Maintenance Engineers perform top-notch regular inspections going beyond mandated standards. EXPERIENCED Laurentide Aviation was founded in 1946 and has consistently achieved high marks with Transport Canada. PROFESSIONAL CLASSROOM Our large classroom, equipped with all necessary visual aids and materials is a perfect environment for professional pilot training. DIVERSE INSTRUCTORS We offer customized bilingual instruction to suit any style of learning.